This year was a great pear year. 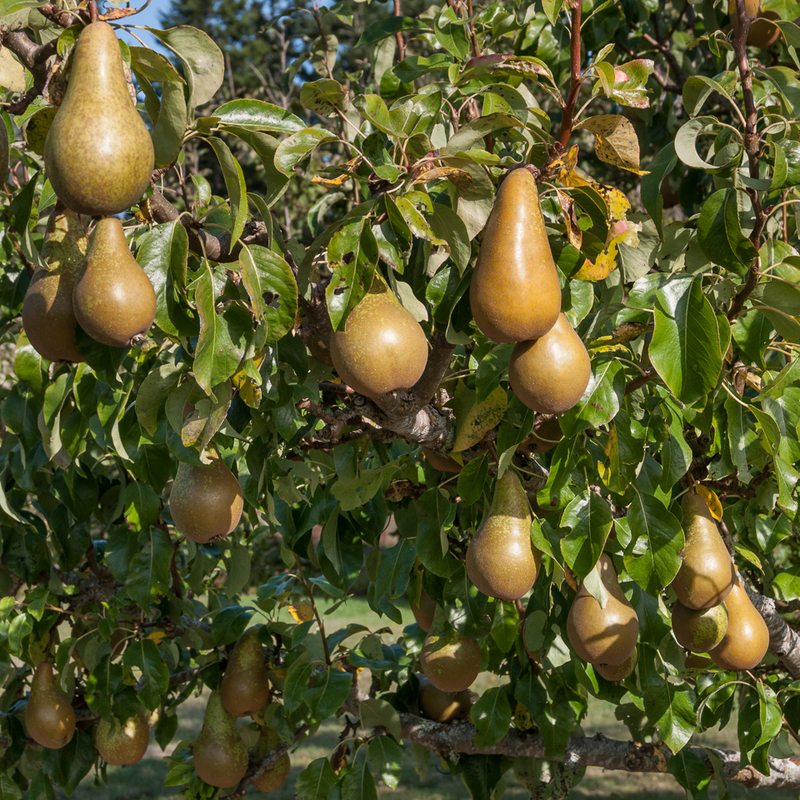 Our Orcas, Highland, Conference and Comice pear trees all produced many pounds of pears, 526 pounds to be exact. We’ve already dried boxes of fast-ripening Orcas pears, filling the food dehydrator every day for over two weeks and packing gallon jars with these chewy pear treats. The Highland, Conference and Comice, all of which require a chilling period before ripening, are stored in a generous friend’s large fridge, giving us the luxury of a slower pace and longer pear season as we bring out and ripen one box at a time. While I was waiting for the Highlands to reach perfect ripeness, I came across a recipe for roasted pear and rainbow chard salad. I wasn’t so interested in eating raw chard from my winter kitchen garden, but I was really intrigued by the idea of roasting pears. The recipe author emphasized that pears that aren’t quite perfectly ripe become “sweetly delicious” when roasted. She’s right. 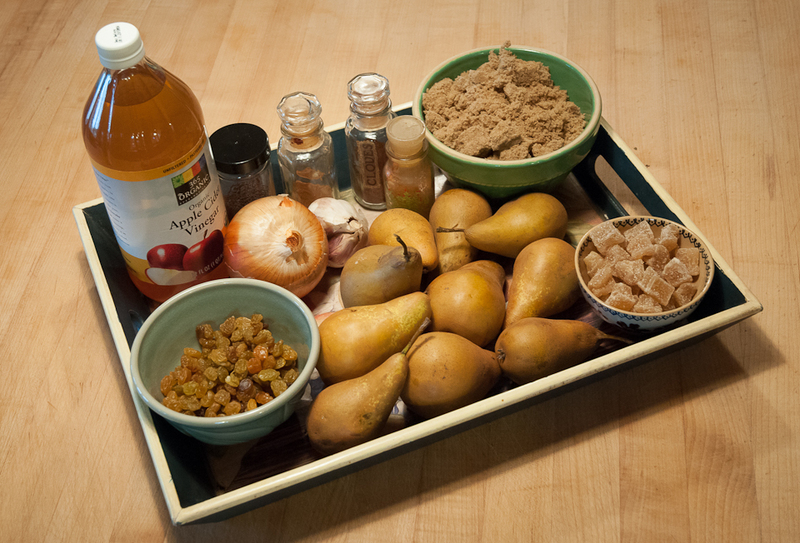 It’s a magical transformation and the resulting pears are perfect for all sorts of uses. And even though this method is recommended for not-quite-ripe pears, ripe pears gain wonderful flavors from roasting too. 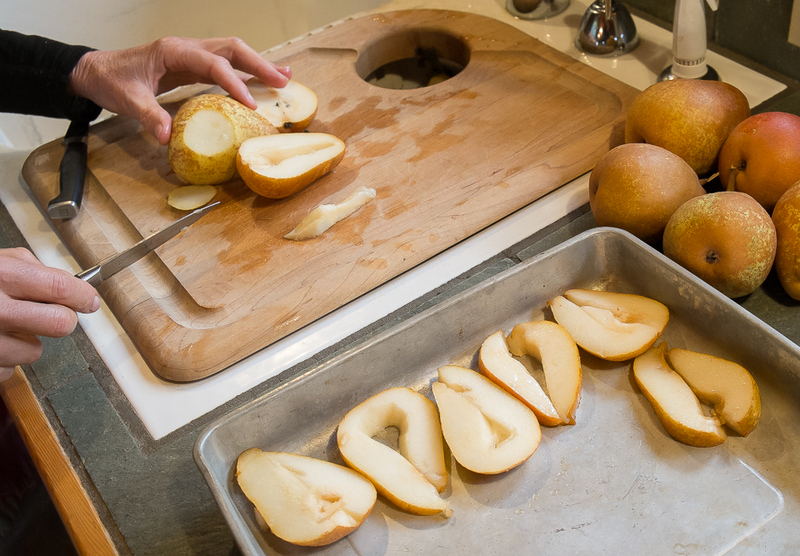 To roast pears, cut them in half lengthwise and cut out the core. Next, remove a bit of skin and pear from the outsides of the pear halves to create a flat surface. 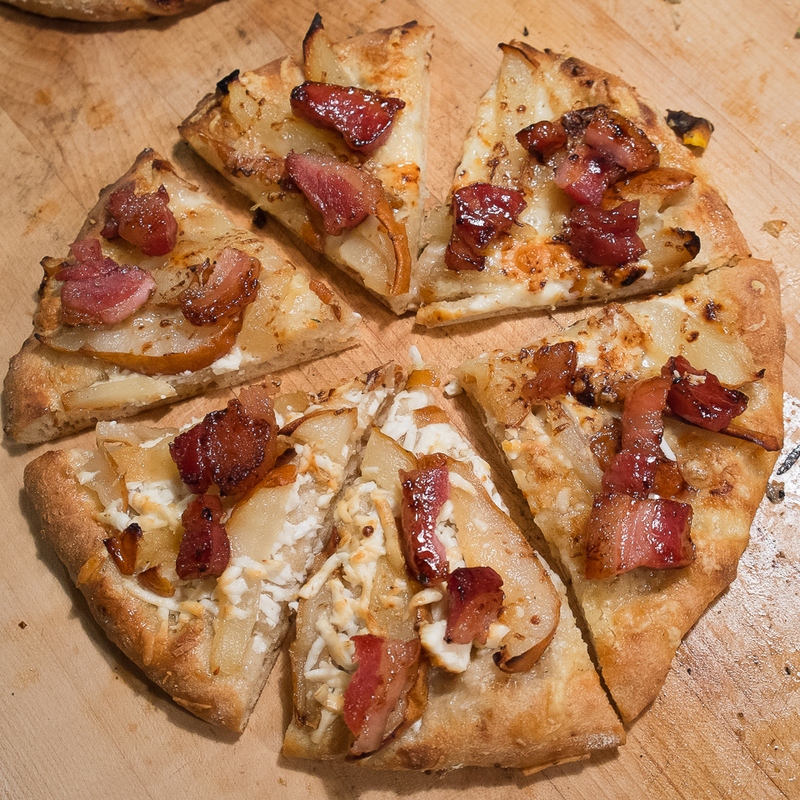 Finally, cut each half in half again so that you have four half-to-three-quarter-inch slices of pear. Arrange on a sheet pan and brush with either olive oil or melted butter. I’ve found that the olive oil adds a nice flavor for salads while the butter is tastier for desserts or breakfast. Roast at 375 degrees for about 20 minutes, turning them after ten minutes so both sides caramelize and brown. 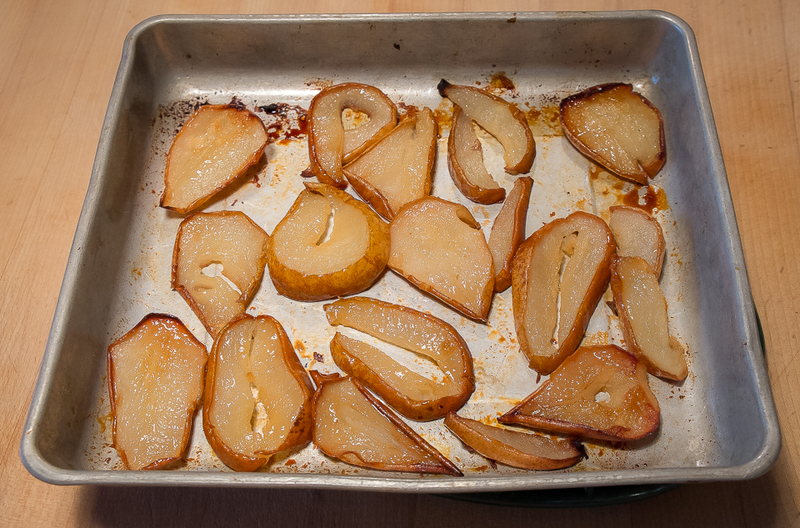 You can also roast the pear halves instead but I find the thinner slices cook more evenly and have more tasty caramelized surfaces. Pears and pork are also a perfect pairing. The other night I served pork sausage, roasted pears and cornbread to accompany poblano chile soup. Another night, roasted pears were a perfect side for a pasta sauce of sautéed chard, onion and bacon. 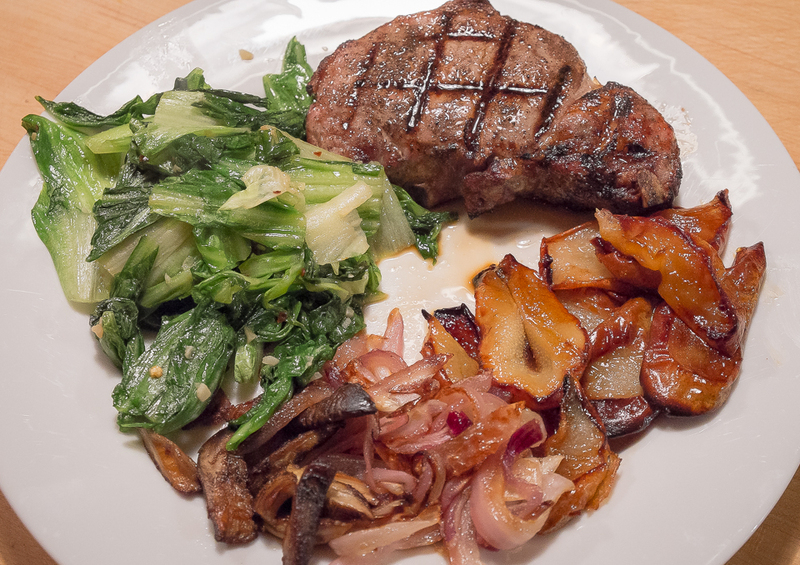 And then there was roasted pear and bacon pizza for an informal dinner and for a more formal meal pork chops with darkly roasted pears on the side next to sautéed red onions, wild mushrooms and chicory. Breakfast and dessert turn out to be more great venues for roasted pears. 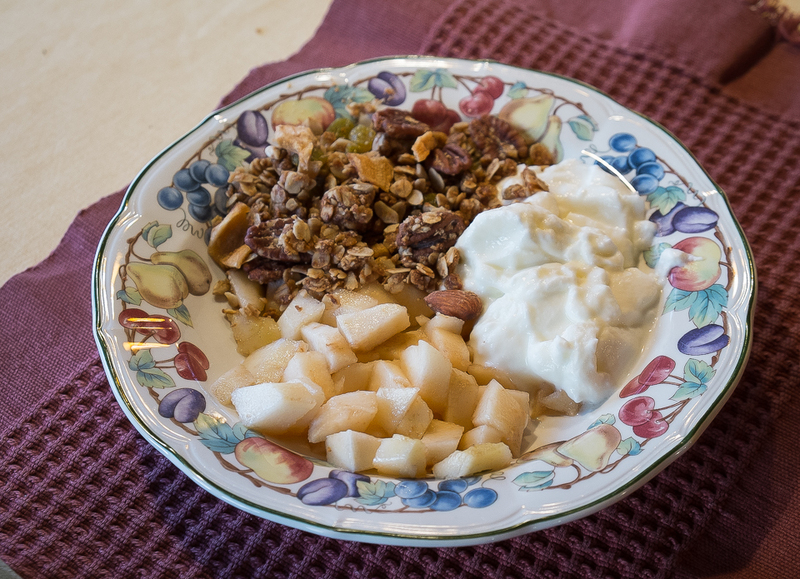 Fresh pears are great with yogurt and granola but roasted pears add their pleasant caramel softness to breakfast. And for dessert, roasted pear slices on their own are lovely; added to cream, ice cream or custard they would be lovely too. There are half a dozen more boxes of pears in my friend’s fridge so many opportunities to find more uses for roasted pears. I’m already imagining something new for the Thanksgiving table. I just saw a recipe for roasted pears with roasted Brussels sprouts. I’ll try it between now and T-day. I’ve been working my way through this year’s crop of Conference pears, a pretty and productive English heirloom pear that Scott harvested from his kitchen garden orchard in early October and stored in a friend’s walk-in cooler for a month. We retrieved them in early November and have been ripening several dozen at time. Conference pears are especially good for chutney because their firm flesh holds up to long cooking, but we’ve also been enjoying their creamy texture and honey-like sweetness with yogurt and in salads and desserts. In all these preparations, I’m reminded that the sweetness of pears is a perfect match for spicy, sharp and pungent flavors. 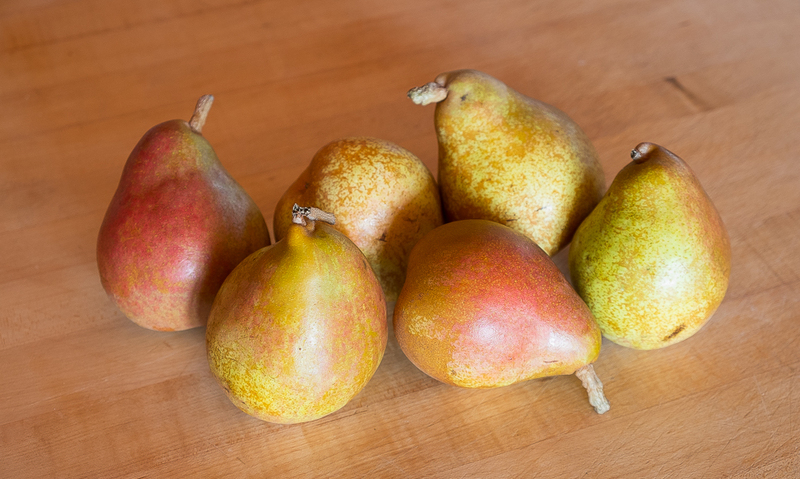 A pear by itself is delicious, but paired with contrasting flavors it’s even better. Chutney is the most dramatic melding of pear sweetness with strongly contrasting flavors. The recipe I’ve made for the past few years calls for pears, vinegar, onion, garlic, yellow raisins, mustard seed, cinnamon, cloves and lots of candied ginger. As these ingredients cook down together, sweet and sharp, pungent and spicy fragrances fill the kitchen, reminding me of all the meals I’ll serve with this rich pear condiment, everything from cheddar cheese sandwiches and baked potatoes to savory tarts, curries and roasted meats. Plain yogurt with its pleasantly acidic flavor is another perfect foil for pears. Yogurt, fruit and granola have been our standard breakfast for years, fruit varying with the seasons. 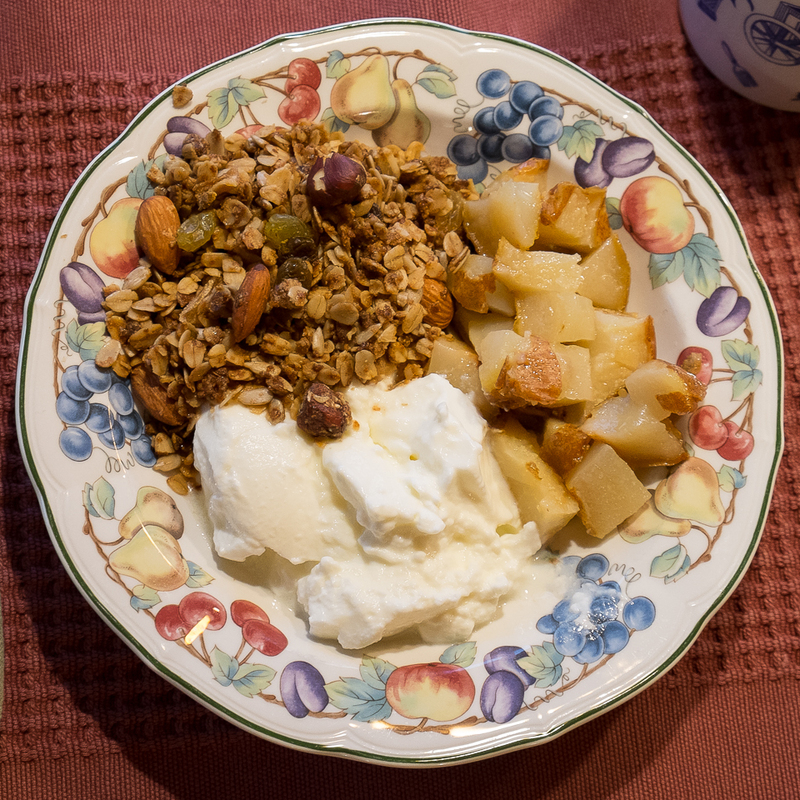 The pear months are especially tasty times because fresh pears along with dried pears in the granola make a double pear experience, lots of sweet to match the tang of yogurt. 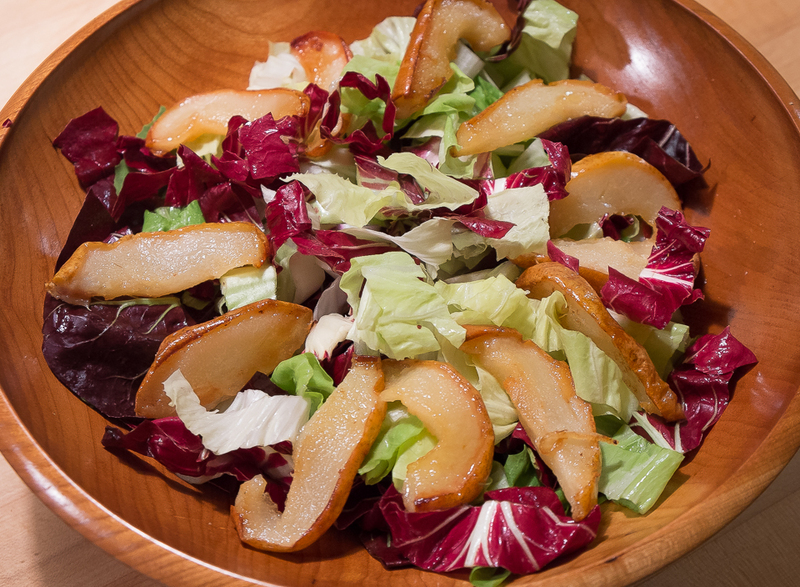 Fall and winter salads are a classic canvas for sweet pears and contrasting flavors. The other night, inspired by a recipe for “Red Mustard Salad with Asian Pears and Pecans” in Alice Waters’ newest cookbook The Art of Simple Food II, I added sliced Conference pears and chopped toasted hazelnuts to a bowl of Scarlet Frills mustard, Giant Red mustard and arugula and tossed this beautiful blend of colors, textures and flavors with a dressing of white wine vinegar, diced shallot, grated fresh ginger, olive oil salt and pepper. Spicy greens, hot ginger, pungent shallot and sharp vinegar met sweet pears in a salad combination I’ll definitely make again. But before I do I’ll make a different salad that combines pears with Gorgonzola or another pungent blue cheese. Arugula or mache would be good greens here and sherry vinaigrette. Next, instead of cheese, I might combine just pears and greens and let mustard vinaigrette provide the contrasting sharpness. 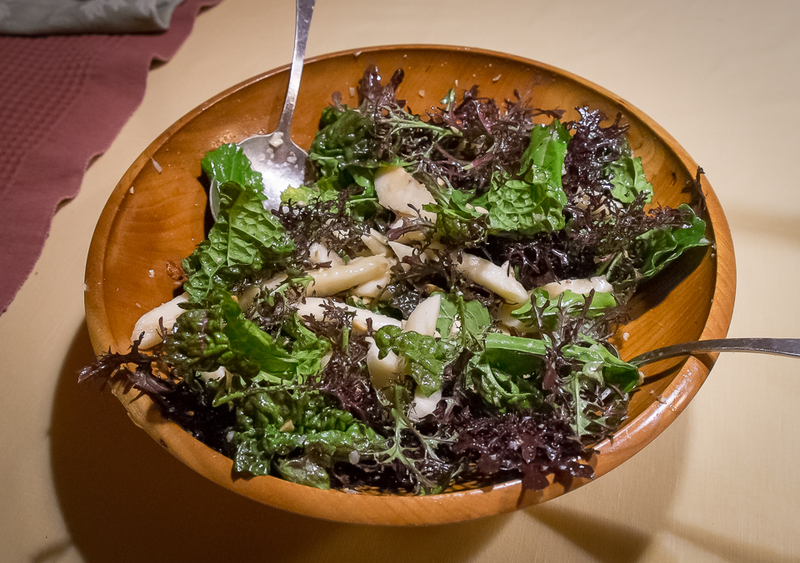 There are so many variations on sweet pear salads. I’ll run out of pears before I run out of salad combinations. Finally, there are pear desserts that bring ginger and other spices into the mix. 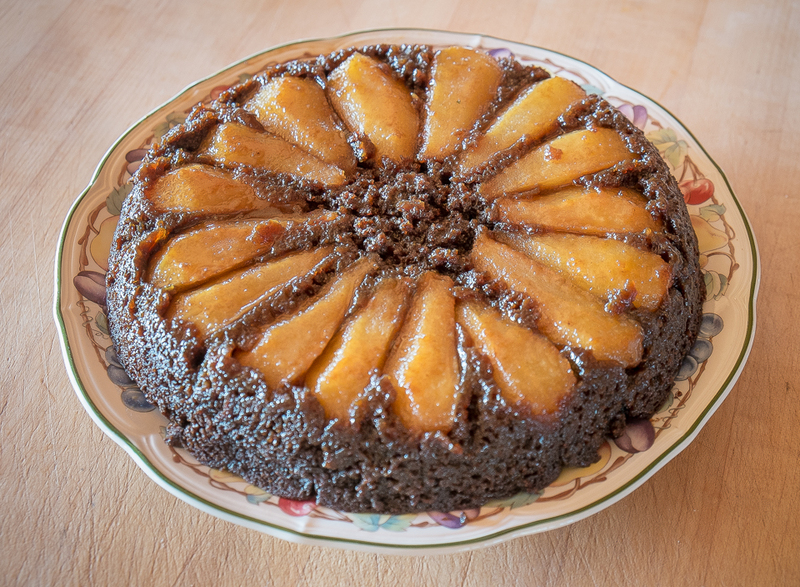 A few years ago our friend Peggy introduced us to Upside down Pear Ginger Bread Cake, a perfect dessert for fall and winter. Wedges of pear soften in sugar and butter beneath the baking gingerbread batter, and the finished cake, pear side up, offers mouthfuls of sweet caramelized pear and spicy, dark molasses cake. And if there’s no time for baking, a perfectly ripe pear makes a lovely dessert too, maybe with a bit of candied ginger on the side. 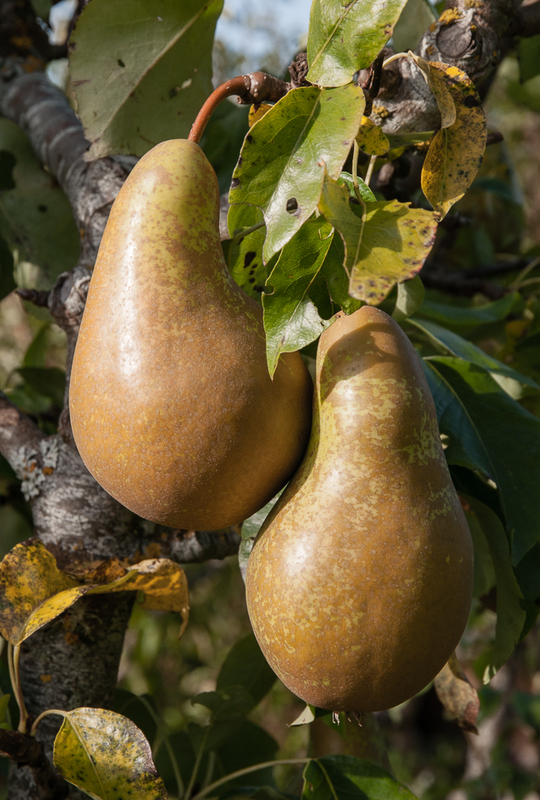 Conference pears fill the gap between our September-harvest Orcas pears and the even later Comice pears. Luckily I have a couple of boxes of Comice pears still in my friend’s fridge, ready to ripen when the Conference are gone. Comice is a classic dessert pear served all on its own but I know I’ll be slipping them into salads and breakfast yogurt too.